Today’s mail brought some eBay winnings. I got a pair of 2008 Topps Silk cards from seller frelly22, who got them out to me very quickly. 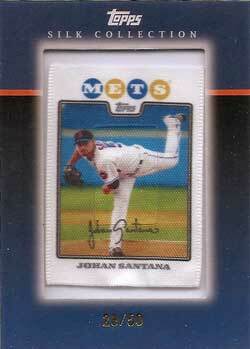 I paid a little over $7 for Johan Santana, and $1.99 for Billy Wagner. The neat thing about the Wagner card is that it’s #50 of 50, so I guess I got the last one. 😀 Of course, it’s a little bit miscut… what are you going to do? I’m not really a big fan of parallel cards any more, though back in the early 1990s I loved them. (At the time, I was collecting Jeff Innis cards, and was happy to get another card to collect… even if the only difference was a foil-embossed logo or a border change.) The silk mini-cards are kind of neat, though. With just 50 of each one produced, it even manages to feel a little bit special when you find one. According to the checklists on Topps.com, the Mets in the set include Carlos Beltran, Carlos Delgado, David Wright, Jose Reyes, Pedro Martinez, Johan Santana, Angel Pagan, and Ramon Castro. 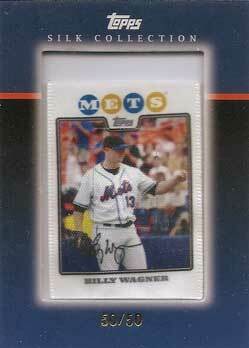 Notice the lack of mention for Billy Wagner, who clearly does have a card in the set. I guess I’ll have to keep my eyes open for a definitive checklist while I’m searching for the other cards I’m missing. I also got a signed 1986 Fleer Ronn Reynolds card from scottdfran, who was breaking up a signed 1986 Fleer set. 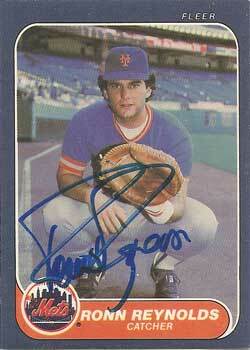 This week, he’s got cards from a nearly-complete signed 1987 Fleer set up for auction. Reynolds was a third- or fourth- string catcher for the Mets from 1982 to 1985, but I’d guess he’d be better remembered in the Norfolk area since he spent more time playing for the Tidewater Tides. According to the back of his 1986 Fleer card, Reynolds hit a (then) career high 33 home runs for the Tides in 1983. He hit a home run in the 16th inning to end a 4 hours, 28 minute game – at the time, the longest ever played at the Tides’ Met Park.